The Four Seasons in Geneva is one of the best hotels in the city, so no wonder Les Bar des Bergues on the ground floor is where the local high society types and the world’s rich and famous mingle. If weather permits, La Terrace is where to lounge and contemplate life over an exquisite cocktail. It’s by far one of the most chic places in town. 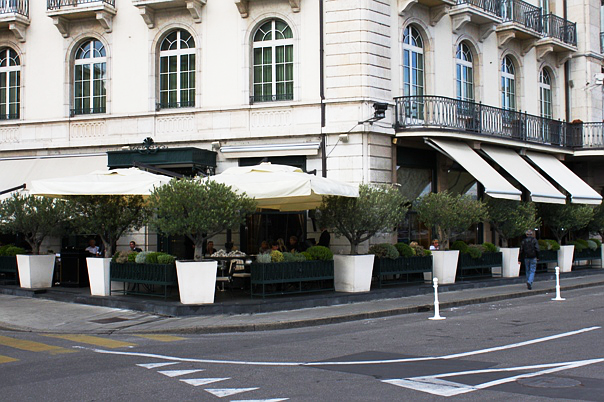 When we visited Geneva in September, we came to Les Bar des Bergues on a couple of occasions and sat both inside and outside for a quick lunch. Now, this is Four Seasons, so no reason to write about excellent service and so on, that’s pretty much clear. However, even though this is technically a bar, the food here is absolutely fantastic. They have a reasonably light menu with plenty of salads to chose from (though our favorite pick was the hamburger, not exactly what one would refer to as light fare but trust us, it was irresistible). If you are on a tight travel budget than avoid Les Bar des Bergues like the plague, but if cash is not an issue, this is the place to mingle and nestle in with the crème de la crème of Geneva. Posted on January 28, 2013, in Geneva, Restaurants and tagged Geneva, Les Bar des Bergues, restaurant, review, travel. Bookmark the permalink. Leave a comment.